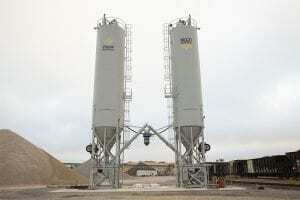 LOUISVILLE, KY (October 30, 2018) – Charah® Solutions, Inc. (NYSE: CHRA), a leading provider of mission-critical environmental and maintenance services to the power generation industry, today announced that it has partnered with Oklahoma Construction Materials (OCM) and completed installation of new fly ash storage silos at OCM’s rail terminal near Oklahoma City. OCM is a leading provider of transload and aggregate supply services. The new silos will serve customers in the greater Oklahoma City region where demand for quality fly ash is growing. The OCM facility provides customers quick and easy access to the nearby Interstate 35 and Interstate 40 to transport products to various regional jobsites efficiently. The new OCM silos can also supply the region with fly ash from other Charah Solutions’ MultiSource® materials network locations. The addition of the OCM facility adds to other recent additions to Charah Solutions’ expanding MultiSource materials network in the South, New England, the Midwest, the Rocky Mountains and California. Charah Solutions has more than 30 nationwide sourcing locations to ensure a steady and reliable supply of Class C and Class F fly ash for ready mix concrete producers and other Charah Solutions’ customers throughout the United States. For more information about OCM, please visit http://www.sherwoodcompanies.com/companies. MultiSource is a registered trademark of Charah, LLC in the United States.